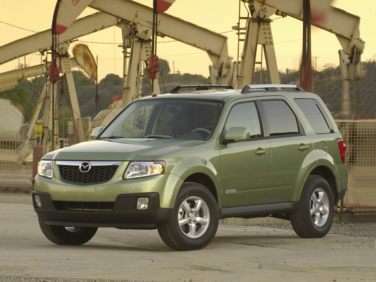 The Mazda Tribute is a four-door, five passenger sport utility vehicle. Mazda’s long partnership with corporate parent Ford has allowed the smaller company to benefit from Ford’s significant research and development budget. This enabled Mazda to introduce certain types of vehicles that it may not have been able to design or engineer on its own. However, sometimes the benefits go the other way, as with the Mazda Tribute. The Tribute is a compact SUV that was designed along with Ford (who sells it as the Escape), based off of the 626 sedan platform. The Tribute and the Escape were amongst the first SUVs to offer a car-like ride combined with good off-road and all-weather utility. The 2008 Tribute rides on a second generation platform that has thoroughly updated the vehicle. The Tribute is a little more recognizably a Mazda now, with a smoother front end, but it still bears the fender flares and flat roofline that suggest truck-like capabilities. There are two different engines available in the Tribute. The first is a 2.3 liter 4-cylinder which makes 153 horsepower and 153 lb-ft of torque. While this is enough power for driving around town, those looking to use their Tribute for more serious hauling will most likely want to opt for the larger, 3.0 liter V6 which is good for 200 horsepower and 193 ft-lbs of torque. As with many Mazda vehicles, the 4-cylinder is restricted to the i level trims, while the V6 is standard with the more upscale s trims. A 5-speed manual transmission is available exclusively on the i Sport, while all other versions of the Tribute are outfitted with a 4-speed automatic. Front-wheel drive is standard, but the option of electronically controlled 4-wheel drive can be chosen for all models. The inside of the new Tribute has seen plenty of changes, adjustments and upgrades. 5-passengers can be fit into the front bucket seats and rear bench, and in general passenger space is ample and comfortable. Interior materials have a higher quality feel than the previous version of the SUV, and small touches like conveniently placed storage compartments and cup holders are scattered around the passenger compartment. Even in i trim, the Tribute comes with a healthy dose of standard features, such as cruise control, power door locks and windows and air conditioning. Upgrading to higher trim levels is only really necessary if power leather seats or increased interior storage is required. Heated mirrors and a moon roof are also standard on the top of the line i and s Grand Touring trim. The Tribute is not a quick vehicle, not even the V6 version, but it is a capable vehicle, and that is what most buyers will be looking for in an SUV. The ride is comfortable and compliant, and electric power steering makes the vehicle easy to handle in the urban jungle. Unfortunately, the previous generation’s rear disc brakes have been replaced by drums in what could only be a cost-cutting measure. It generally doesn’t shine a positive light on a car company to reduce costs by removing safety equipment. The 2008 Mazda Tribute is a good option for anyone looking for a sport-utility vehicle that is small enough to easily pilot through city traffic yet spacious enough to carry the entire family and a healthy amount of luggage. The 2009 Mazda Tribute has a number of changes to both the interior and the exterior. The biggest change may be the new engine. The new engine, a 2.5 liter, inline-four engine that produces 171 horsepower replaces the 2.3-liter, inline-4 engine from the 2008 models. This has made the Tribute more fuel efficient and is more practical for the heavy weight of the vehicle. The standard transmission is a six-speed automatic. Models with a 2.0 liter, V6 engine are getting an engine that has been improved and that now delivers more horsepower with 240. There is now a new electric power steering system that gives the vehicles even better fuel economy. The vehicle’s front and rear seats have a new look and the there are new audio controls integrated into the steering wheels of the Touring and the Grand Touring trim levels. There is a cap-less fuel system for 2009 on all trim levels. The 2009 Mazda Tribute Hybrid has been given stability control, satellite radio, an air-conditioner economy mode, automatic headlights and stabilizer bars in the front and rear. The rear disc brakes from the 2008 model have been changed to drums in 2009. Each of the other trims has also been given more standard features. The base model Sport trim comes standard with automatic headlamps, 16-inch wheels made from alloy, power accessories, air-conditioning, an auxiliary audio jack, a CD player and cruise control. The Touring trim level now has audio controls on the steering wheel, a power driver seat, tinted rear windows and a roof rack. The Grand Touring trim level has added satellite radio, heated side mirrors, heated front seats, a sunroof, a rearview mirror with auto-dimming, a six-CD changer and leather upholstery. All trim levels have a towing package and a remote engine start available as options.